AKA William Nunn Lipscomb, Jr. 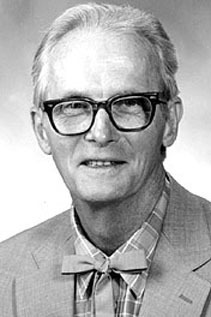 US chemist William Lipscomb is known for his studies of boranes (hydrides of boron), including several ground-breaking studies on the relationship between the function of enzymes and their three-dimensional structure. In a 1954 study, he used x-ray techniques to analyze the structure of boron molecules, and proposed that boron and hydrogen atoms could be held together under some circumstances by a regular covalent bond. He won the Nobel Prize in chemistry in 1976.